I'm a bit of a history buff and it was my major in college. While in Panama I learned about Captain Morgan and Manuel Noriega. I’m sure you've heard of Captain Morgan Rum, but do you know where the name comes from? Captain Morgan was a Welch privateer who left his farm in Jamaica to attack Panama in 1671. A privateer is a sort of legal pirate who had permission from the English government to attack Spanish ships and ports when England and Spain were at war. Morgan had the well-earned reputation of a man who took big risks and offered big rewards for his men. He chose to attack Panama because it was considered the center of Spanish trade in the Americas, as its warehouses contained the goods and valuables of many wealthy merchants. Captain Morgan destroyed the city of Panama, made off with its entire treasure and arrived back on the Caribbean coast with 200 mules loaded with loot. They recently found Captain Morgan's ship! And on an unrelated (super cute) note, here's another Captain Morgan. 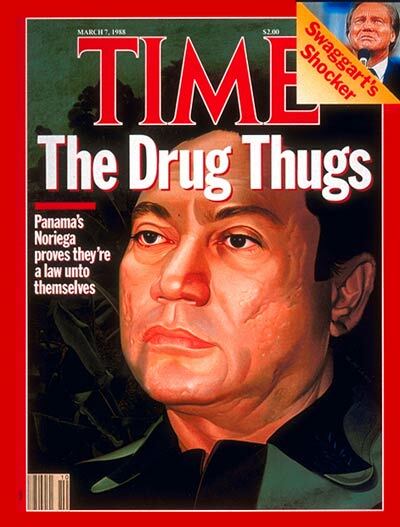 You might recognize the name Manuel Noriega, or just remember the rapper with the same name. He was a Panamanian politician and soldier, committed voter fraud stealing a Presidential elections in Panama, manipulated US foreign policy towards Panama, CIA informer, a player in the illegal drug industry by taking payments from Colombian drug traffickers to allow cocaine to pass through Panama to the United States. In 1989 former President Jimmy Carter was an observer to the Panamian Presidential elections which resulted in voter fraud by Noriega and a coup. In response the US imposed economic sanctions and there were a number of hostilities between Noriega’s troops and American military forces stationed in Panama. President George H. W. Bush authorized a military invasion of Panama, of more than 27,000 troops, then the largest American military action since the Vietnam War, with the sole purpose of deposing of the dictator. The United Nations condemned the invasion as a flagrant violation of international law, however according to a CBS poll, 92% of Panamanian adults supported the U.S. incursion, but a documentary said that the Panamanian surveys were completed in wealthy English-speaking neighborhoods in Panama City. On the fifth day of the invasion, Noriega took refuge in the Papal Embassy in Panama for 10 days. Since the US was not allowed to invade the embassy, they used psychological warfare by blasting rock music around the clock. After ten days of Operation Nifty Package, Noriega surrendered on January 3, 1990 wearing a nun's outfit. The U.S. saw Noriega as a double agent and the state Department nicknamed him "rent-a-colonel" and believed that he gave information not only to the U.S. and U.S. allies, Taiwan and Israel, but also to communist Cuba. He also sold weapons to the leftist Sandinista government in Nicaragua in the late 1970’s. He was a close ally of the United States and pledged to help the Reagan administration in their efforts to destabilize the Sandinista government in Nicaragua. After the Iran-Contra Affair, Noriega became a liability to the United States. Once captured he was taken to the US where he stood trial for drug trafficking, racketeering, and money laundering but during trial he was forbidden from discussing the nature of his 30 years of work for the CIA or the amount they paid him (he claimed $10M). This was a landmark trial which marked the first time that a former head of a foreign government had ever faced criminal charges in an American court of law. He served 17 years in an American prison before being extradited to France for trial on money laundering, then later to Panama where he is in prison today.